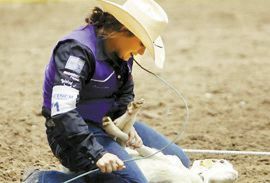 STEPHENVILLE, Texas — Tarleton State University’s five-time goat tying qualifier for the College National Finals Rodeo in Casper, Wyo., has the routine down pat. First, have a stellar regular season. Graduate student Baili Collins did that, winning the event title in the highly competitive National Intercollegiate Rodeo Association Southwest Region, her second regional championship. She also twice took regional reserve champion honors.